Not every toy holds its value, but just because something is worth less now than you paid for it ten years ago, doesn't necessarily mean it isn't a cool toy worth owning. 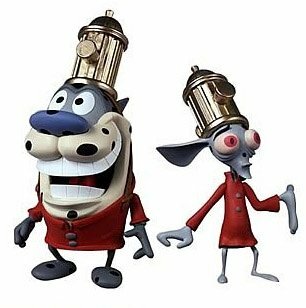 Case and point - Palisades Toy's Ren and Stimpy Fire Dogs action figures. This Wizard World exclusive was also available through Palisade's official fan club. These dotted dolts feature magnetic golden fire hydrant helmets and would make any fan of the classic cartoon smile like an imbecile. This pair is selling for the criminal price of $7.99. While we're hiking up the palatial Palisades memory mountains, Invader Zim was another line that only Palisades could tackle and do any kind of justice to. Ms. Bitters here will set you back $3.19. The awesome desk accessory is worth the price alone. Where are you seeing Zim figures for 3 dollars? 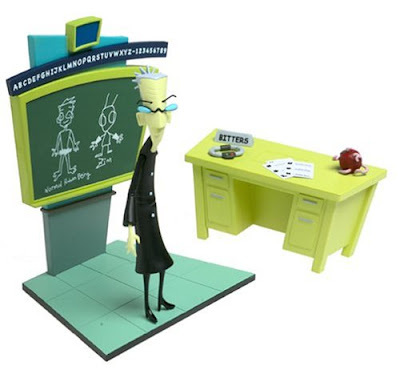 I check ebay now and then and its near impossible to get a good deal on Zim stuff. Single figures tend to go for around 20 a piece. Way more for variants. Hey Paul, if you click that picture of Ms. Bitters, it will bring you to an Amazon page where she is that price.